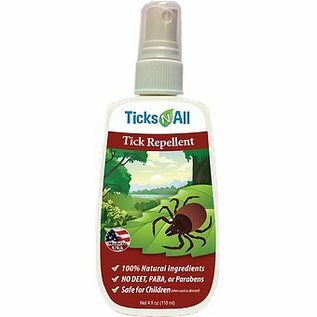 Our tick repellent is formulated with the finest natural ingredients to keep ticks away from you and your family for up to 4 hours. Our tick repellent was formulated with natural ingredients to repel ticks and other insects for up to 4 hours. This specialty blend consist of 11 active ingredients: Castor Oil, Sesame Oil, Cedarwood Oil, Lemon Grass Oil, Soybean Oil, Rosemary Oil, Peppermint Oil, Citronella Oil, Thyme Oil, Clove Bud Oil, and Geranium Oil. Mixed with our rejuvenating blend of: Coconut Oil, Guar Gum, and Organic Citrus extract. Due to high demand, please allow 7-10 business days for shipping.